This base is a wonderful and portable design. It releases maximum length and entertainment plasma arcs given a very modest power supply. It uses a very nice wood primary wound with exactly 1/4 inches between wraps and is separated with cutting board material. The tiny vacuum gap provides excellent quenching for the tricked out 14.4KV 50ma NST . Operating Tesla Coils coils are enigmatic and beautiful. They can be partially understood as art, or as engineering, or as science, but even to this day, they are not understood. 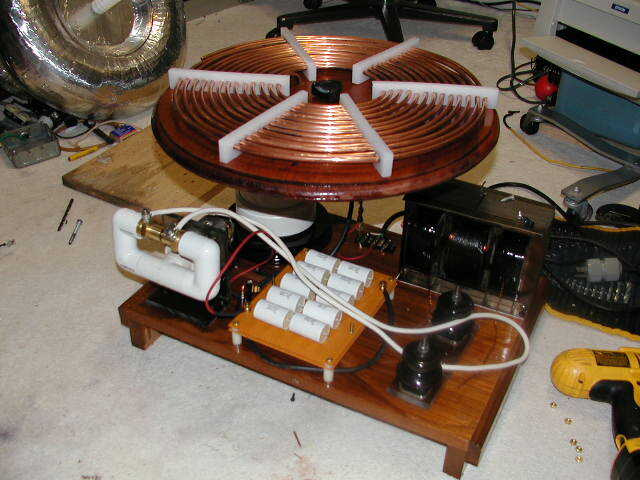 Every Tesla Coil that you see here is for sale, as are components, tanks, resonators, etc. Some are more valuable than others in combinations, or as favorites, but we will negotiate pricing on any of the items pictured here. The psycho coil is a particular arrangement of parts and an absolute tuning of the system, that generates the longest building streaming arcs ever seen at our facilities, given the relatively low power 14.4KV 50ma NST. This design is incredibly durable and can handle strikes directly through its own internal components on a regular basis. We have been designing and selling secondary coils, primary coils, matching power supplies, capacitor banks, LTR, RC, and GTR designs to advise coil performance for years. If you want the maximum output from a relatively low power tank, the psycho coil is the best model we have discovered so far. If you want other characteristics please inquire within. This is a little blurry indoor shot because we are holding the camera with our hands with a two second exposure set on the digital camera. 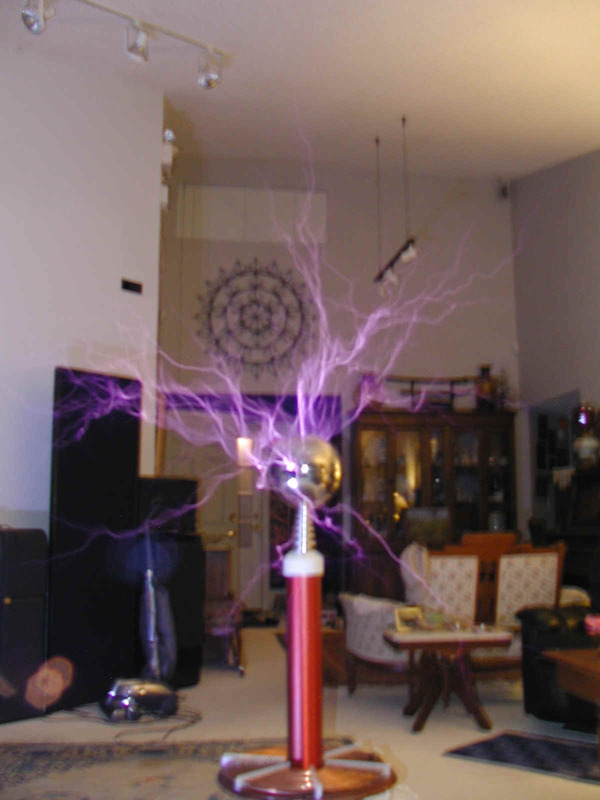 The flame and excitement of a Tesla Coil cannot be represented accurately with a camera. 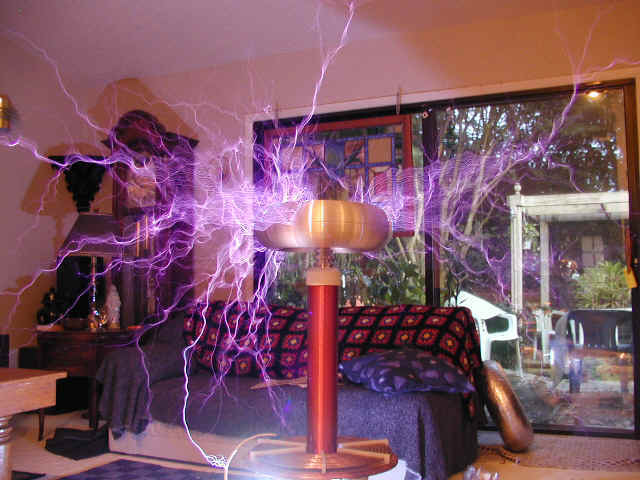 We often take pictures like these to increase the effect, but even these pictures do no justice to enjoying the beautiful fractal discharges and and dancing energy of a real live running Tesla Coil. The psycho coil is actually running in the living room with the standard house ground. This is not a recommended process. 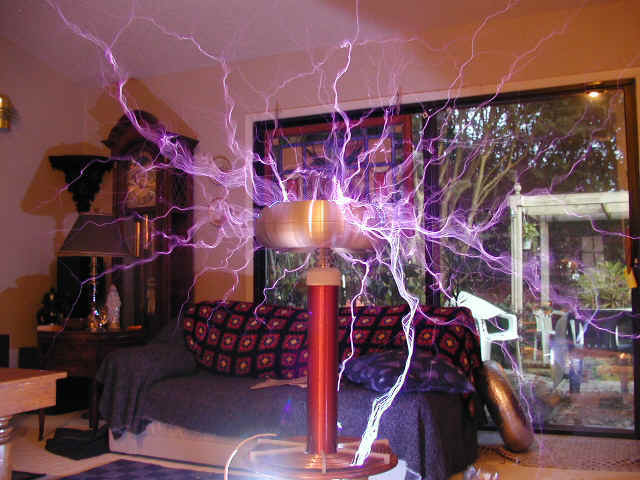 You should always use a solid independent RF ground for all your Tesla Coil experiments. There is no safe location to hide while this coil is running. This overall coil has become known as the "psycho coil" The psycho coil is pictured here running indoors with no special RF grounding. This type of experiment should never be attempted. Always properly ground all electric equipment in your home according to the laws governing your community. Another astounding performance from the psycho coil.